St. Charles, Ill.-based Lechler Inc. introduces its patented Ramp Bottom nozzle, which features uniform spray distribution and extended life compared to other nozzles. The uniform spray is created by the nozzle’s hollow cone, which also reinforces the chamber’s wall. 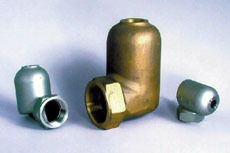 The nozzle is a one-piece construction with a large free passage area, which helps to resist clogging. They produce a fine spray even at low pressures—ideal for water cooling and aerating, dust suppression, scrubbing and washing gas and chemical processing.